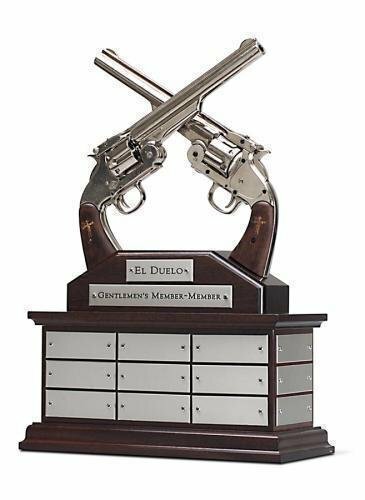 Custom trophy bases can turn a regular cup trophy into a long lasting perpetual trophy. Fantasy Football enthusiasts can find the best bases for trophies here. Great ideas for donor recognition as well. Most of these are custom designs, so each needs to be quoted separately, and do not include the item on top. All engraving is additional. A typical high end custom base starts at $1,000. Custom perpetual trophy base. The item on top could be anything, but we show a fireman's helmet here (not included). The front of the base has a gold, laser engraved header plate describing the award, and the sides are completed with 9 plates for annual updates. We can customize this base to fit your unique needs, but the example shown is designed to hold a fireman's helmet and is made of genuine black walnut. The overall size of this piece is approximately 18" x 14" x 8", and the top surface where helmet is placed measures 16” L x 12” W.
We can also make this base in maple or cherry and can customize the size to fit your project. Contact us for a quote on a custom size. Fireman's helmet is NOT included, you must supply that. Custom perpetual trophy base. The item on top could be anything, but we show a set of dueling pistols here. Front has a header plate describing the award, title plate and room for 24 plates around the base. Great for donor recognition as well. Pistols on top are included in price. Everyone picks something different, so contact us about your needs. 16.75" x 11.5" x 9". Made of genuine walnut. Production lead time for this trophy is 40 days. custom perpetual base - 24 plates 16.75" x 11.5" x 9"
Production lead time for this trophy is 75 days. 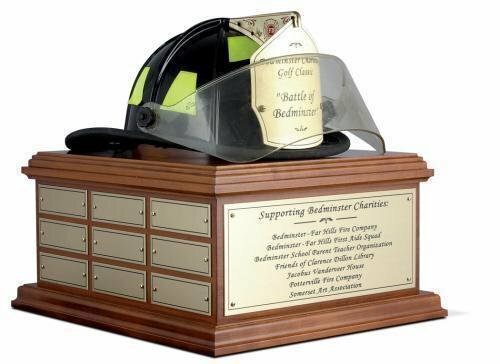 This is an example of a two-tier, round custom wood base for a perpetual trophy or donor recognition display. A nickel-finished cup is attached to the base. The cherry finish is complimented by rows of individual aluminum plates. An aluminum header plate is included on the top tier. Price inclues silver cup. If a cup is not what you are looking for, the item on top can be customized to meet your needs, additional charges apply. This base comes with 40 curved aluminum plates, 4.5" x 1.25" each. Engraving available, but not included in price. 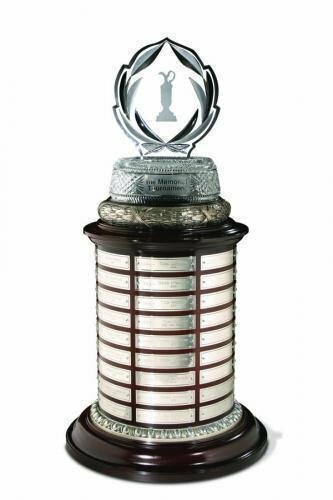 Overall size including the cup is approximately 12 1/2"w x 32"h x 12 1/2"d. Cup is approximately 8"h.
Two Tier Perpetual Trophy Base 14 with Nickel-Plated Cup, approx 12 1/2"w x 32"h x 12 1/2"d overall.